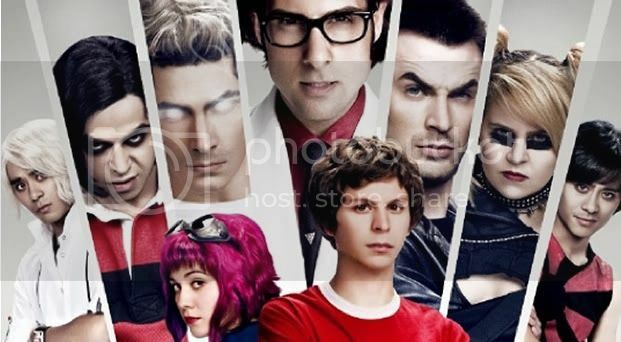 Let me preface this with a statement I find wholly truth by every meaning of the word: the Scott Pilgrim vs. The World series is one of (if not THE most) important series to grace the video game world. Seriously. If you do not partake in this series, your life is incomplete and you’ll never be happy for as long as you live. Alright, now that we are aware of the awesomeness… let me explain it a bit further. I’ve read the comics, I’ve played and beat the game, and have now seen the movie. I love the music of Beck. I’ve played video games since I was 3 years old. I like epic amounts of epic epicness… so… really, this series is a biography about me. It’s hard to say what is so great about it without spoiling it… so let me allude to things directly corresponding with the series, as well as things that have been said by the creator and other random Scotty P goodness. If you know me at all, you know I love Mega Man. I grew up on the series: it contained my first boss fight, it was the first game I ever beat, and the first game I was able to complete in 45 minutes. So when I saw that this game was originally pitched as Mega Man 2… I couldn’t help but get wet with excitement. 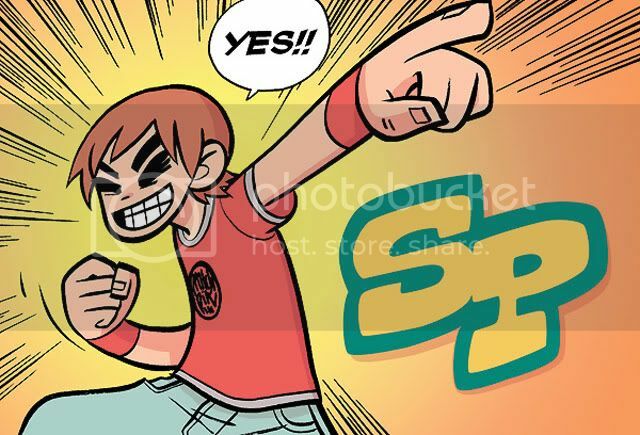 And then an interview with Bryan Lee O’malley came out… and what did he say? “…I tried to literalize this sense of having spent time playing Mega Man, it’s kind of like you were Mega Man for those hours of your life. It’s like, ‘Oh, I was Mega Man. '” Hi Bryan, I just wanted to let you know that I love you. I think we are the same person. Just thought you should know… and then, he poses the question of what would you do if you played a game… but thought it was actually your past? 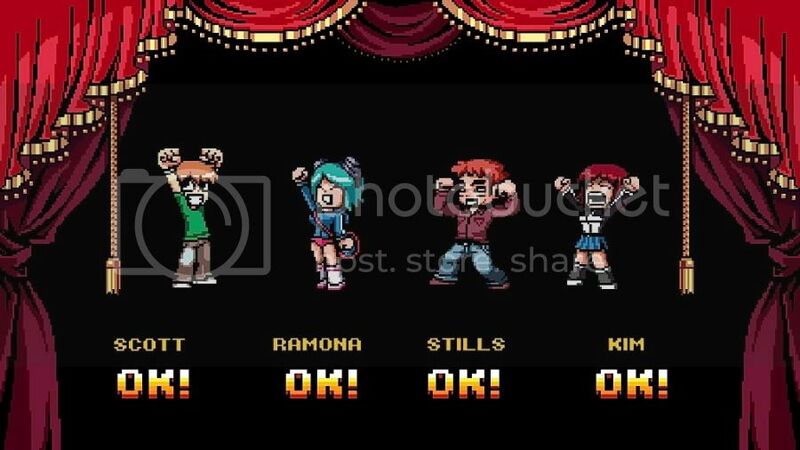 Like River City Ransom; what if that was his high school experience? Statistically, this isn’t a crazy thought. In fact, a fifth of society remembers things that never even happened…Bryan… are you able to be any cooler? The answer is no, unless you let me interview you. I’d love to have your adopted babies. You can read the full interview HERE. Speaking of video games… let’s talk about the game. Its got many classic games thrown into one, with an awesome art style, a very simplistic version of the story (as well as a different ending), and nudges at nerdiness that pretty much anyone that has played video games this past decade or two can appreciate. Some of the greatest things the game does are the labels for each character, which really take off during the credits… the twins are probably one of my favorites… I won’t spoil it though. Aside from that, there are the cutesy characters, the subspace highways, and the crazy physics game play. Let’s not forget about the music… Hello, Ananamanguchi!!! You guys are one of the reasons I bought the game. Epic band is epic. Oh, and if awesome games aren’t awesome enough without zombies… this has zombies. So yeah. Go play it. Now the movie… ohhhhhhhhhhh the movie. I never wanted it to end. I was sad when the credits started rolling, to be honest. The world that Edgar Wright was able to bring to life from O’malley was truly magical. I never doubted he could do it, with such classics as Shaun of the Dead and Hot Fuzz underneath his belt, I just never fathomed how awesome it would really be… I read the comic a certain way, and just never thought it could be portrayed how I imagined it being… yet, here it is. In all its super flashy glory. Seriously, if there was some way I could live in this universe, I’d do it. Sure, the movie isn’t fleshed out too much once you get a couple evil ex’s in, but… but… it’s just too awesome to care about that. And if you’ve read the comics, you know what’s going on, so you’re perfectly fine with that. Also, the characters were casted perfectly. I cannot imagine any of them being played by anyone else having seen it now… casting perfection. I want to go see it in the theater, by myself, and just able to have a nerdgasm the whole way through without having to worry about anyone else being there. I’m seeing this movie at least five times in the theaters, and am signed up to be notified of when I can pre-order the blu ray of it. You better believe I’m getting it, no matter what my money situation is by then – it’s worth it. If you are only going to see one movie in the theater this year… make it this. I promise you won’t be disappointed. And if you are… well, that’s too bad. I’m not going to do anything about it. Why not? Because there is something wrong with you if you don’t like this movie. Now go read, play, or watch Scotty P before you die in a car crash, your house burns down, or you get stabbed by a psychotic ex of your own sweetheart. I decided to take the image embedding a bit further, so let me know your thoughts in the comments or forum found HERE. Also, let me know your stories about this magnificent series and how it’s changed your life either below or the aforementioned forum link.